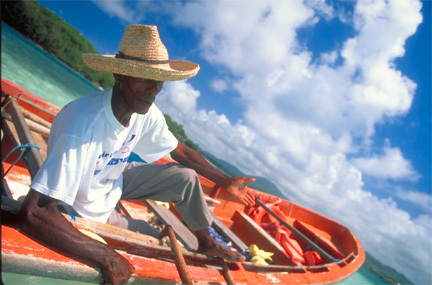 Fishing is an important part of the culture of Martinique. Martinique’s local culture is diverse and well developed, so there is much to experience and celebrate on the island. The beautiful L’Atrium performing arts center in Fort-de-France offers theater, dance and musical performances on a grand scale. Local artists exhibit in galleries throughout the island and some open their ateliers (workshops) to visitors. More than a dozen museums, each with a distinct personality, offer visitors a wonderful opportunity to explore Martinique's history and heritage. The museums are small, designed for easy visiting, and are scattered throughout the island. Some are devoted to famous islanders such as the Empress Joséphine (l'impératrice), others to historical events like the eruption of Mont Pelée volcano and still others to prehistoric Martinique, the abolition of slavery, the production of rum, etc. There is a wealth of sightseeing attractions, special events and Caribbean festivals on the island throughout the year. The Tourist Office Information Desk at the airport stays open daily until the last flight comes in. Complimentary maps, magazines and information booklets are available from the English-speaking staff, which is well versed in suggestions about what to see and do. Among free publications in French and English are the digest-sized Choubouloute, a compact listing of island happenings, as well as descriptions of self-drive tours designed by the Tourist Office, along with many other items of tourist interest. From Rio to Trinidad to New Orleans, the world’s most celebrated pre-Lenten Carnival fetes all pale in comparison to Martinique’s Carnival in one key area – length. Each year as revelers in other Carnival hot spots wind down with the close of Shrove Tuesday, the party in Martinique keeps going, reaching a decadent climax on one of the most solemn days on the Christian calendar, Ash Wednesday. Formerly known as the Paris of the Caribbean, the northern coastal town of Saint Pierre was instantly transformed into the Pompeii of the Caribbean when on May 8, 1902 Mount Pelee erupted. Out of the centuries-old destruction Saint Pierre has emerged a quaint yet vibrant town, offering visitors a unique view of the island’s storied past. The May in Saint Pierre event commemorates the anniversary of the eruption with a series of lectures, presentations and guided tours offering greater insight into this historic event. Martinique shares, with distinctive panache, mainland France’s love for gastronomy. One of the best expressions of this passion occurs each year during Sainte-Marie Culinary Week, a weeklong festival celebrating Martinique’s unique gastronomic heritage and traditions. At the center of the festivities is a cooking competition. Each year, several local food products are chosen for competing chefs to use as the centerpiece of their culinary creations. The competition extends throughout the week, with special dinners, cooking demonstrations, a street fair and more providing an in-depth introduction to Martinique’s culinary scene. Some of the world’s greatest musical forms hail from the Caribbean, with reggae (Jamaica) and calypso (Trinidad) the most widely known, but true music lovers know that Martinique also ranks among the music capitals of the region. Martinique is the birthplace of Zouk, a rhythmic music developed in the 1980’s through a mix of many different styles, including compas, balakadri, cadence and bal granmoun, mazurka and biguine, French and American pop, and kadans, gwo ka and other indigenous styles. La Fête de la Musique is a celebration of Martinique’s rich musical tradition with free concerts performed in the streets throughout the island. Carnival and sea are brought together for a celebration unlike any other during Martinique’s famed Yawl Boat Race (Tour des Yoles Rondes). Held each summer over a one-week period, the Yawl Race attracts local and international yachtsmen skilled in sailing traditional yawl boats for a race around the island. The race is contested in stages with throngs of locals and visitors crowding the shores to cheer on the racers. Carnival-style celebrations punctuate each day’s victory earned along the way, while on the high seas hundreds of yachts, catamarans, speedboats, and other private vessels trail the racers, partying along the way. Le Tour de Martinique is a smaller version of the famed Le Tour de France bicycle race. Just like it’s larger cousin, Le Tour de Martinique is held each summer and features and international field of riders competing in stages. The race reaches virtually every corner of the island, with fans and spectators lining the day’s route to offer cheers and support. Less competitive than Le Tour de Martinique, this amateur cycling race is ideal for recreational riders seeking an alternate way to tour The Isle of Flowers. Local as well as visiting riders participate annually, with crowds lining the course each day. The Caribbean’s longest running jazz festival, the Martinique Jazz Festival has long provided a showcase for local and international artists to share their talents with a lively and appreciative crowd of music lovers from all corners of the globe. Jazz luminaries who have performed at the Martinique Jazz Festival in years past include the Marsalis brothers, Dee Dee Bridgewater, Paquito d’Rivera, Chucho Valdes, and many more.